What do vegan teens eat? Here’s some easy vegan meals for busy teens. Many think eating vegan must be very limited, super difficult or really expensive, but none of that’s true. 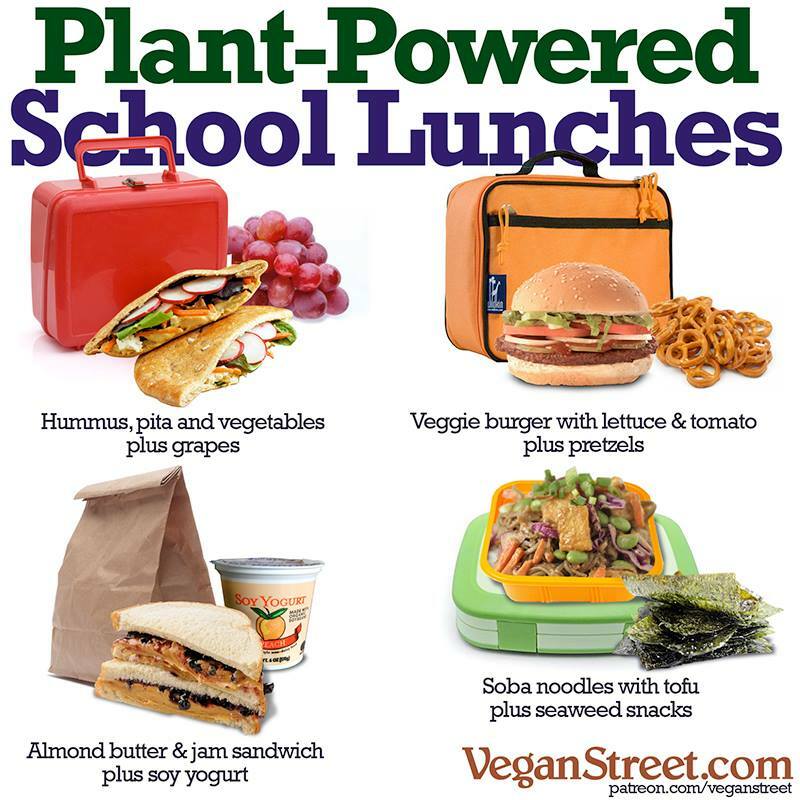 Here’s some easy vegan meals for busy teens that show anyone how to get started on a vegan diet. But please don’t think these ideas are all vegans can eat! In fact, most who go vegan experience an exciting new array of foods they never knew they loved. That’s because going vegan gets most people to look outside their usual food purchases and experiment with new plant-based cuisines (Chinese, Vietnamese, Thai, Mexican, Greek, Indian, Ethiopian, etc.). As your tastes change as a vegan, your enjoyment of new foods really grows! Hummus is cheap and easy to make (there’s a million recipes online). Most grocery stores sell it in ready-to-eat form as well. If you spread hummus on a tortilla with lettuce, tomato, avocado and Greek olives (if you like those), it’s a super easy meal. Falafel is also a good option. Many stores—from your local health food coop to major commercial grocers—sell prepared falafel in their refrigerated sections. As a cheaper alternative, bake falafel patties from falafel mix and then freeze them in baggies. Thaw a few patties whenever you want to add falafel to a hummus wrap. 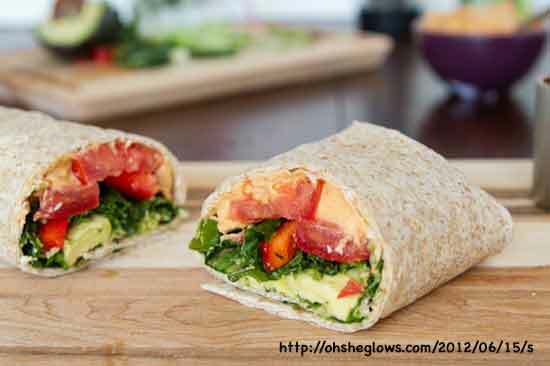 Falafel, hummus, olives, avocado and veggies in a tortilla wrap is delicious, easy, protein-packed and very filling. Tip: My favorite tortilla bread is the large Stacy’s wheat ones sold at health food stores. You can buy a few packages and freeze them if you don’t go to the health food store much. (No, I have no connection to that company. I just like those flat breads a lot better than what’s at regular grocery stores.) If you’re not digging the burritos and wraps I recommend here, try changing your tortillas. Grocery stores increasingly offer ground crumbles (like Gardein and Beyond Meat) as an easy substitute for meat. However, some people consider them expensive. Beans, on the other hand, are cheap and delicious. I love Amy’s canned refried beans in burritos. Plain canned red beans are a super cheap meat substitute in tacos or burritos. You can lower costs even further if you prepare dried beans. If you’re adding salsa, lettuce, Daiya vegan cheddar shreds and/or avocado to your burritos and tacos, you’ll probably barely notice it’s beans and not meat. 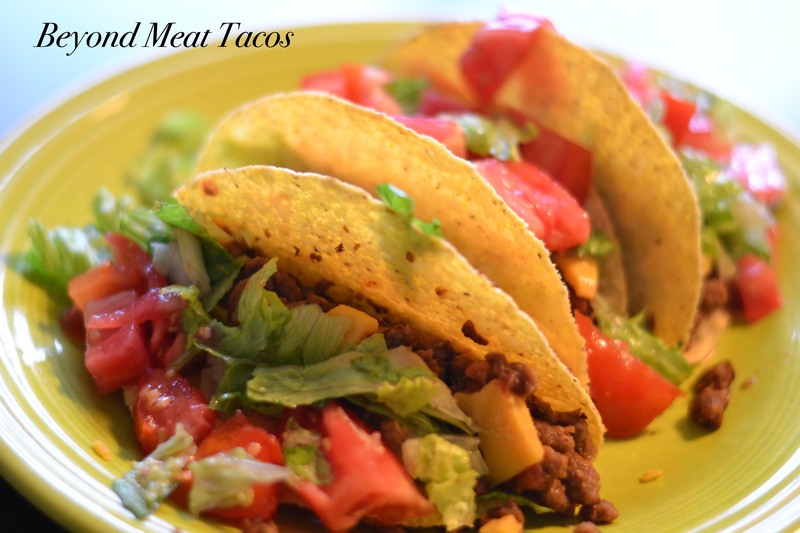 Tip: Sprinkle some chili, garlic and onion powders on the red beans that you put in the tacos. If you want to be healthier, keep some prepared washed greens in the fridge and add a little to your bean burrito. I add fresh spinach to mine and barely notice it’s in there. Bake a sweet potato, slice it, and top it with canned black beans and red salsa. It’s so easy! If you want to get extra healthy, sauté some kale and put it on it. I know it probably sounds weird, but it’s surprisingly good! You can throw corn chips on the side. Do you like the taste of chicken or tuna salad but not the cruelty? Canned chickpeas are your new best friend! You don’t have to put in the onion or celery or seaweed powder ingredients here in this recipe video. Use the same flavoring ingredients you like in your tuna or chicken salad. Tip: Just Mayo is amazing! If you make a big batch of this chickpea salad, you can make delicious sandwiches for days. Kelp powder adds the tuna fishy taste in this recipe. If you can’t find kelp powder near you, try ordering from a store online. Spaghetti with marinara sauce is easy, but I missed parmesan cheese. That is, I missed it until I discovered you can mix almond meal, nutritional yeast and garlic salt to make a vegan substitute. 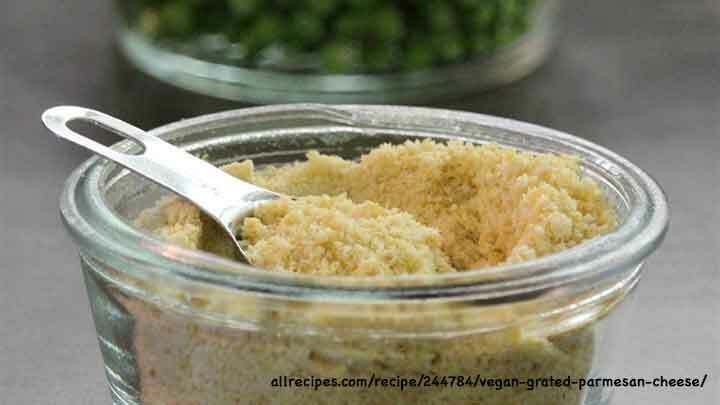 Tip: Since I was so addicted to dairy parmesan, this vegan parmesan took a little getting used to, but now I think dairy parmesan is so gross when I accidentally taste it. My tastes have really changed dramatically. Don’t give up if you don’t like it as much as dairy parmesan right away. 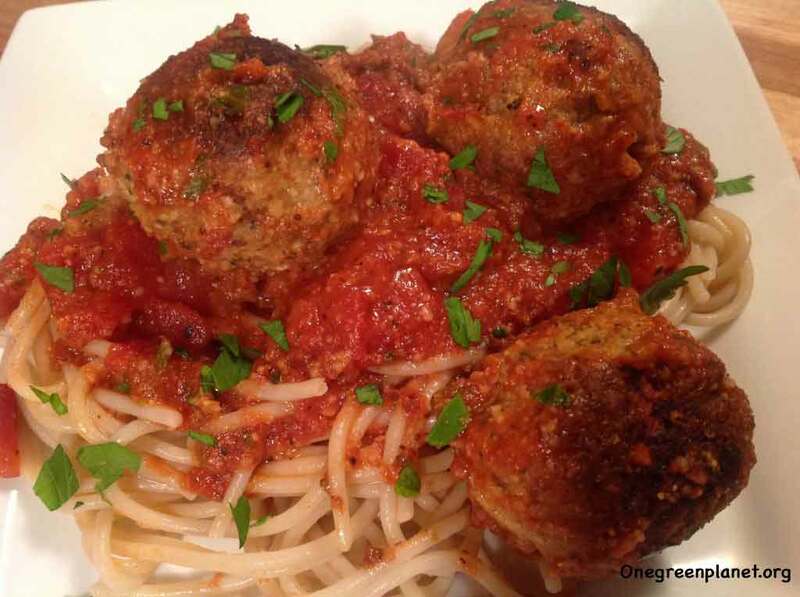 Also, some make their own healthful vegan meatballs, but many grocery stores sell pre-made ones that cook in just minutes. If you have raw cashews and a blender, you can make an easy cream-of-any-veggie soup. For example, put some cooked broccoli or a can or jar of tomatoes in a blender. Add water, salt and some soaked cashews. (You don’t need to soak the cashews if you have a high-powered blender, like a Vitamix). Hit blend, and you have cream of broccoli or cream of tomato soup in one minute! You can even make vegan carrot ginger soup that tastes like the one Whole Foods sells in the ready-to-eat section of some stores. Mix cooked carrots, a pinch of ginger, water and raw cashews. Or make cream of canned pumpkin soup with a dash of curry or coriander spice. Really, you can make any cream of veggie soup with cashews. (For example, cream of tomato, broccoli, celery, asparagus, etc.). Eat your soup with some whole grain bread or crackers, a salad and/or fruit for a huge, filling and easy meal. What’s easier than cooking ramen or rice noodle packages? Unfortunately, they’re not nutritious on their own, so make sure to add veggies and maybe some baked tofu. Keep a bag of fresh chopped kale in your fridge, or keep some frozen vegetable mix, broccoli or kale in your freezer. 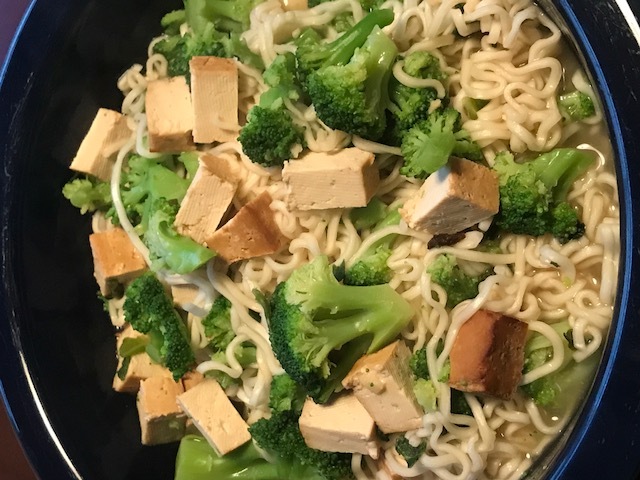 Cook the veggies and add them to ramen noodles (and cubed tofu, if using) after you prepare them. Tip: Health food stores often sell seasoned, pre-baked tofu packages. My family buys ramen or rice noodle soup packages from health food stores, because they’re vegan and don’t have a lot of preservatives, unlike the ones from regular grocery stores. Even at a health food store, they cost just 88 cents per package. 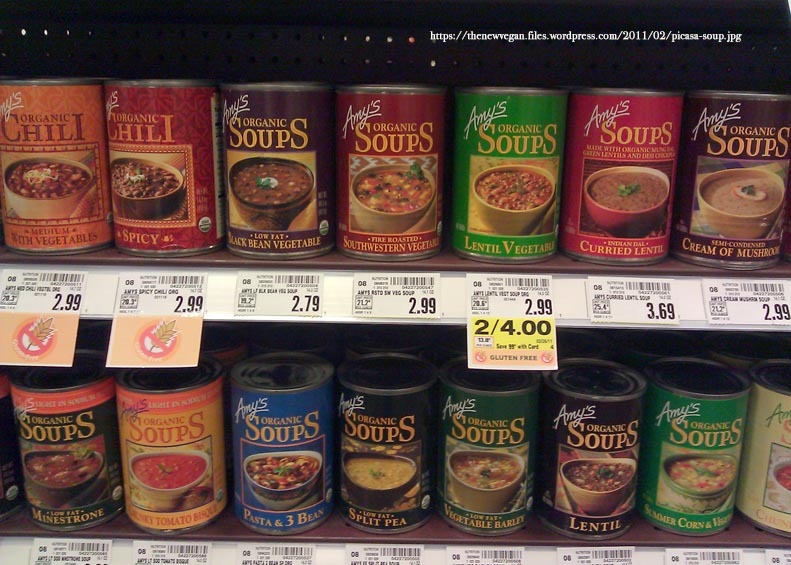 Amy’s brand soups have a lot of vegan options for a super-fast meal. If you want something heartier than just soup, buy bags of frozen brown rice, or freeze individual portion of cooked rice in freezer bags. Add some rice to a bowl and then top it with a canned soup that contains lots of bean or lentils. Microwave and eat! Keep bagged or washed lettuce in your fridge, and you have soup and a salad in a snap! Do you like chili? Canned chili beans, jarred or canned tomatoes, green peppers & onions, chili powder and a handful of brown rice or barley cook up really easily if you boil and simmer. You can make a bunch at a time and eat it for days. 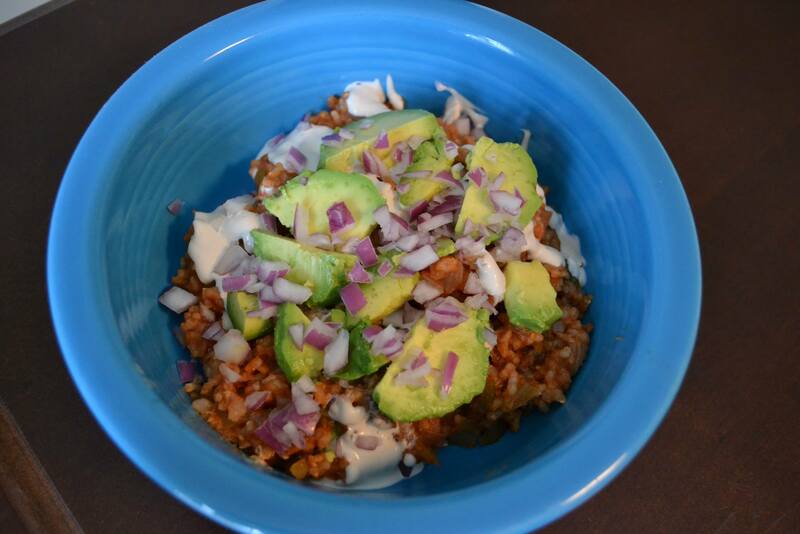 I eat my vegan chili with avocado and red onion on top. Tip: No time to chop? Grocery freezer sections usually sell inexpensive frozen chopped onions and peppers. Want more punch? Add some garlic (fresh or powder) when cooking the chili. Frozen veggie burgers are really easy too, since you can thaw out just one at a time (Amy’s black bean burgers, Gardein burgers, etc.). Or, you can find a recipe for veggie burgers online and freeze them yourself. I try to always put tomato, red onion and kale or romaine lettuce on my veggie burgers to make sure I’m eating enough veggies. As a side, you can eat fries (of course, they’re vegan!) and/or baby carrots. Open a can of vegan baked beans for a fast side dish, and it’s even better! Tip: Freeze hamburger buns so you have them on hand. I eat sprouted grain rolls from the health food store. For a meal in 60 seconds, throw on a plate some bagged lettuce (like romaine mix) and any veggies you want. Then add Beyond Meat chick’n strips, which are usually in the grocery freezer section near the vegetarian selections. Those chick’n strips are not cheap, but you don’t need a ton if you’re just one person. If you chop them up, they go a long way. Add salad dressing, and you’re ready to eat! Just Mayo and Daiya both sell some vegan ranch dressings that are my favorites. Some days, if I’m really lazy or super busy, I’ll do this: Thaw a sprouted whole grain bagel from the freezer in the microwave and toast it. Then, smear it with Miyoko’s vegan cheese or Daiya chive cream cheese, and add a sliced tomato with salt. Almost everyone loves grabbing a quick PB&J sometimes. Try to choose natural peanut butter, though. Conventional peanut butters usually have hydrogenated oils, added sugar and other unhealthful ingredients. Natural peanut butters contain just peanuts and salt. Peanut butter and banana on a whole grain bread is a healthful and delicious variation on PB&J. Youtube has a bunch of channels if you search “cheap vegan” or “easy vegan.” Follow Instagram and Facebook vegan foodies for other ideas. For example, Youtube vegan teen The Vegan Activist has a Complete Guide to Vegan Food video here. Over time, you will find food ideas that you really like and can prepare easily. 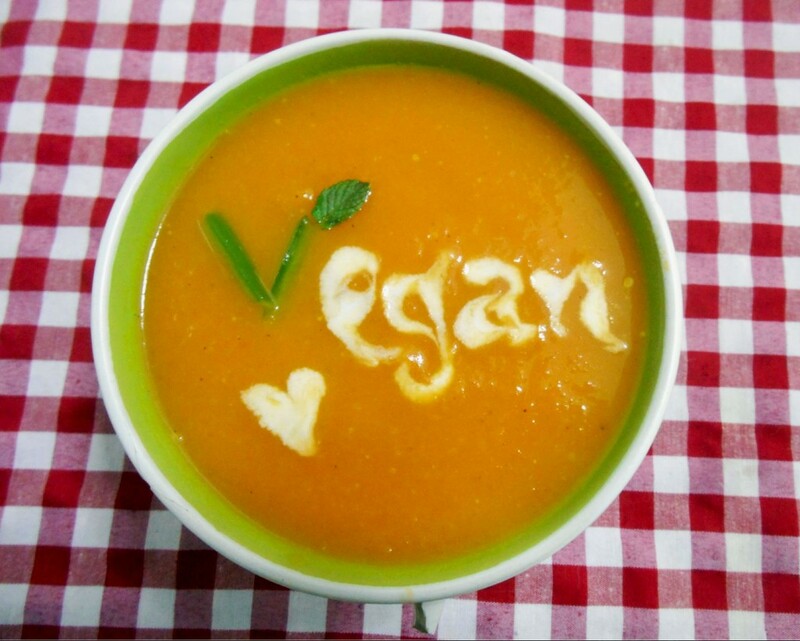 You’ll discover that vegans love to share food suggestions and recipes! 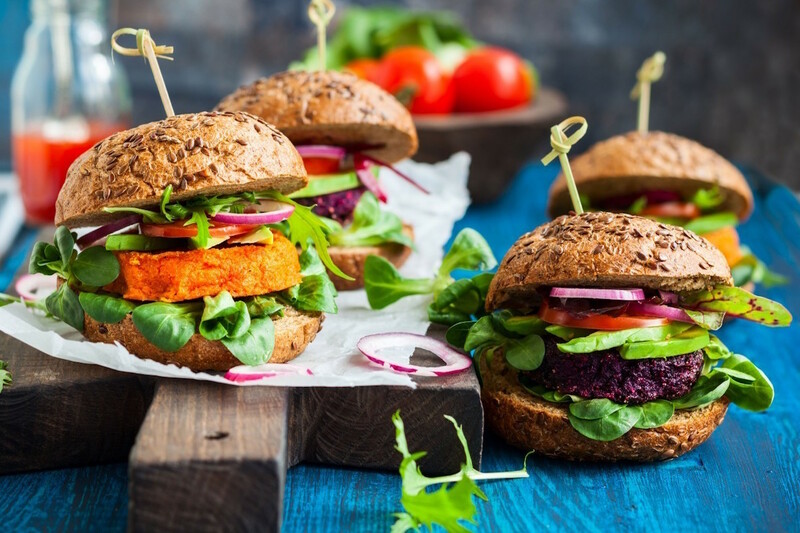 Check out “vegan fast food guides” online, including this one from One Green Planet and download their Food Monster app. If you’re not eating fast food, check out the Happy Cow app for vegan and vegan-friendly restaurants in your area. P.S. Please know I will never use this site for paid advertising! I’m just sharing with you my favorite vegan products that sometimes make my life easier and more delicious. For more support and advice about going vegan, please see the Q&A section. Great site! I just found this by looking up began teens and viola! Great tips and I will check those resources out! I’m thinking of being vegan but I feel like I will once I have a sure grip on substitutes! Thanks! Awesome you’re thinking of being vegan!!! If you need any suggestions for the best substitutes, you can ask on reddit’s vegan subgroup, Vegan Teen Sanctuary on Facebook, or just email me through the contact page! Thanks for the compliment on this site! Let me know any questions you have, and I’ll do my best to answer!